Yuppiechef is an online kitchen store that stocks over 60 amazing brands like Le Creuset and Global knives which you might have spotted on Masterchef South Africa, KitchenAid, Victorinox and Eva Solo to name a few. They also have a pretty fabulous registry service. They’ve shared with us some of their advice as to what to consider when choosing and setting up a registry. Friends and family coming to your wedding want to spoil you with a gift. They want to buy you a gift that you want. A gift registry is a great way to make sure that they know what you want. The gifts that you want. Your wedding gifts are for you to enjoy for the rest of your marriage. Make sure that the place that you choose to have a registry has the products you covet. Let your family and friends spoil you. The least wedmin possible: You have enough on your plate. You’re planning a wedding. An online registry is convenient and stress free. Our registry will take literally (we’ve timed it) 30 seconds to sign up to and then you can add and remove items at your leisure and as and when you remember them. In the comfort of your home and when you have a chance at work. Convenience for your guests, locally and abroad: This is where the online registry is again king. With an online registry your guests don’t need to mission to the shops and they can access your gift registry whenever and from wherever they choose. Once you’ve chosen where you are going to have your registry you need to choose which gifts you would like. When you are adding items to your registry be sure to add enough items to your registry for all your guests and a range of prices to suit every pocket. A registry is a great opportunity to build coordinating collections such as knife or pot sets. Add a few bigger items in case your friends and family want to club together to get you something that you really want. Oh, and don’t forget to tell your guests! Whether on the invitation, on your wedding website, via email, word of mouth or pigeon carrier, make sure everybody knows about your wedding registry. If you have any questions about setting up your Gift Registry on Yuppiechef, contact the Yuppiechef Team on +27 (0)861 987743. 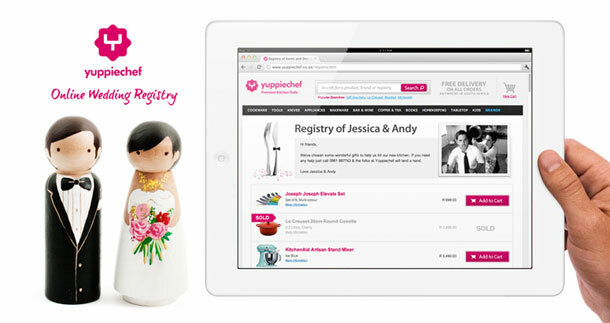 Alternatively you can visit Yuppichef’s Gift Registry to start your registry. We’re so glad you like it! Thanks for such a fabulous wedding registry for brides and grooms out there. Thanks for a super article.